Bootheel Senior Corps Directors serving their communities for over 30 years. Front Row, left to right: Shirley Lacey and Jennifer Rosener. 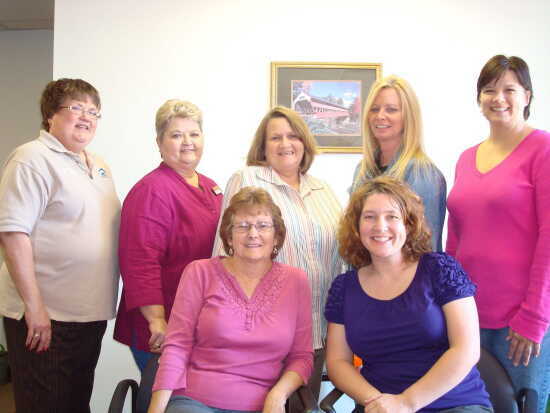 Back Row, left to right: Vicki Rhew, SaDonna Thompson, Brenda Brewer, Tina Dohogne, and Jeannie Collins. Volunteering is a great way to make a positive impact in your community. Many people don't volunteer because they don't know where to go and how to offer their help. Why should you volunteer? Have you ever heard the saying, "It takes a village to raise a child"? This is a very true statement, and can be applied to many situations. One person cannot do all the work, but one person CAN make a big difference! You may not think that your time will help others, but it will. It's a wonderful way to make new friends and become involved in a meaningful community project. Senior Corps is a program of the Corporation for National and Community Service, an independent federal agency created to connect Americans of all ages and backgrounds with opportunities to give back to their communities and their nation. Under Senior Corps are three tremendous programs: Retired Senior Volunteer Program, Foster Grandparent Program and the Senior Companion Program which offer many opportunities to serve through the gift of volunteering. The Retired Senior Volunteer Program (RSVP) connects volunteers, age 55 and over, with service opportunities in their communities that match their skills and availability. From building houses to immunizing children, from enhancing the capacity of non-profit organizations to improving and protecting the environment, RSVP volunteers put their unique talents to work to make a difference. These volunteers can give as much or as little time as they want. There is no restriction. They can choose for themselves if they want to volunteer once a week, once a month, once a quarter. It is totally up to each volunteer. RSVP tailors to their needs and interests and to what a volunteer wants to do. The Foster Grandparent Program (FGP) connects volunteers, age 55 and over, with children and young people with exceptional needs. Grandparents mentor, support, and help some of the most vulnerable children in our communities. FGP is a dual purpose program by meeting the needs of the children as well as the seniors. An FGP Volunteer receives a stipend of $2.65 per hour, volunteers at least 15 hours per week and has to fall under certain income guidelines to qualify as a volunteer in one of these programs. The Senior Companion Program (SCP) brings together volunteers, age 55 and over, with adults in their community who have difficulty with the simple tasks of day-to-day living. Companions help out on a personal level by assisting with shopping and light chores, interacting with doctors, or just making a friendly visit. An SCP Volunteer receives a stipend of $2.65 per hour, volunteers at least 15 hours per week and has to fall under certain income guidelines to qualify as a volunteer in one of these programs. There are many advantages and benefits in contacting us directly; that would be diversity of assignments, support from our dedicated staff, and having peace of mind. For our senior volunteers, it helps them to live a longer healthier life after they retire--keeping them motivated and continuing to play an active role in their hometown. Our dedicated staff is here to help anyone interested in becoming a volunteer. With over 30 years of experience in the field of volunteerism, we can assure any individual willing to take on this task, that it will be one that is rewarding and fulfilling to all. Contact the following Bootheel Directors if you are interested in becoming an RSVP, FGP, or SCP volunteer.